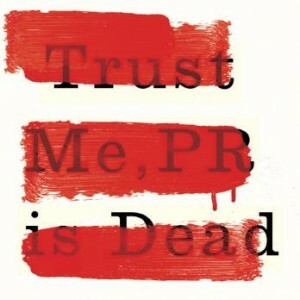 After a year or so of trolling the PR industry about its ‘inevitable demise’, Robert Phillips has published his second book, Trust Me, PR is Dead. As one of the 250 people that ‘supported’ the book on Unbound, the crowdfunding publisher, I received an electronic version a few days ago, ahead of the hardback copy in March (I’m told). And now having read it, I find myself agreeing with more than I anticipated and much of what Robert said. That is, perhaps, because Phillips didn’t reveal the whole story about his latest work – something he chastises organisations for in its pages – it isn’t simply about public relations and what he describes as its point of no return, it has a much wider remit that encompasses trust, leadership, business, politics and society too. It’s a bold man who claims his, some would call radical, re-imagining of business and communications would be championed by Aristotle, but then boldness was never Robert’s problem. He is quick to deride those who describe PR as a profession, and he’s right to! Only around one-in-six people working in the UK PR industry are signed up to either the CIPR or PRCA code of conduct and fewer still are engaged in Continuing Professional Development (CPD). There are no qualifications, nor examinations required to become a public relations practitioner and while it’s not an amateur industry, Robert is correct in pointing out the lack of talent, knowledge and understanding that brings into junior PR roles. Data and measurement too feature heavily, and again I find myself in agreement with the author, we have been too slow to embrace data, too slow to adopt meaningful measurement metrics that prove our value to clients. This is nothing particularly new or shocking. The evolution of business in the age of social media has been dramatic. It has revolutionised the way we do business and the way we communicate. It has helped usher in an ecosystem where truth and transparency, not content, is king. As Robert says, it is no longer acceptable to ‘wallpaper over the cracks of an organisation’, no longer justifiable to ‘put lipstick on pigs’. The rise of the empowered citizen – he claims – has necessitated the move from public relations – through public engagement, the model Phillips used to modernise Edelman before his departure – to Public Leadership. According to Robert, Public Leadership is activist, co-produced, citizen-centric and society-first – which despite frequently criticising the use of soundbites, he takes great pleasure in repeating throughout his 300 page work. Organisations should ‘speak through actions, not words’ he says, spin cannot protect businesses that say one thing and do another. Actions speak volumes and the empowered citizen public is listening intently. This vision of Robert’s calls for sustainability; profit optimising, not maximising; calls for business to add real societal value, not simply ‘greenwash’ with CSR; calls for leaders to think of colleagues and customers before shareholders; calls for flattened hierarchies and the downfall of ‘tired elites’. For the most part I see the same vision as Robert Phillips – as much as someone on the opposite side of the political spectrum can – but I don’t agree that public relations has to die out for this vision to be realised. Robert’s future of public leadership is much the same as my future of public relations, differing slightly, but mostly in name. In my view, the CIPR and its 10,000 or so members, are making real progress towards a more professional industry and taking steps towards becoming a more credible business discipline, especially those who are actively engaged with its work and are enrolled in CPD. But such significant change cannot happen overnight, we must give it time. This book is less about the fitness of PRs to practice and more about businesses needing to get with the times, embrace change, be truthful and be transparent. It is about them being responsible and adding public value. It is about the long-term success, not the short-term gains. And, it is about our need as public relations people to evolve with business and not be left behind.